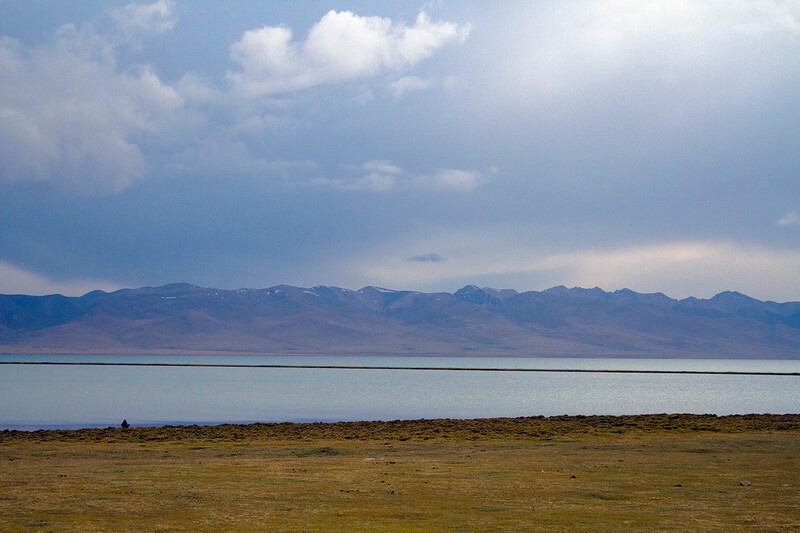 Yurt camping by Son Kol Lake. 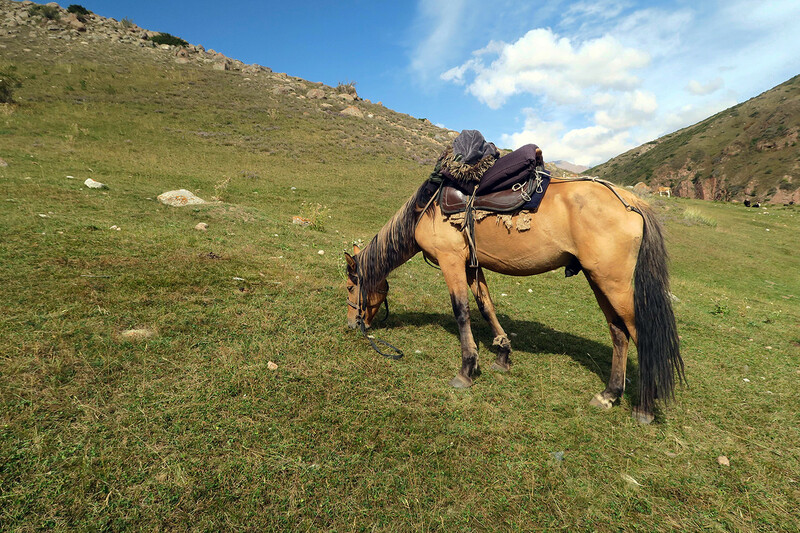 I was a bit apprehensive about spending two days on the back of a horse, riding through Kyrgyzstan’s northern mountains. Horse riding is something I love, but it makes me nervous. When your childhood horse throws you from its back so violently that you break your arm as you hit a nearby gumtree, you’re going to have leftover emotional scarring. Every time I get on a horse now, I feel a pang of anxiety. Throw in a terrifying fear of heights (we were riding across mountainous terrain) and you’re going to have more than a case of bad nerves. I eyed the buckskin gelding I’d chosen. He gazed back at me, a look of indifference in his face. He was to spend two days carrying me up and down mountains, along tiny paths for hours at a time. I couldn’t help but feel that I had the better end of the deal. Once I swung up onto the back of my buckskin friend, all my anxiety disappeared. I could do this. I’d been doing it since I was 11. But I would keep my helmet on the entire time. You know. Just in case. 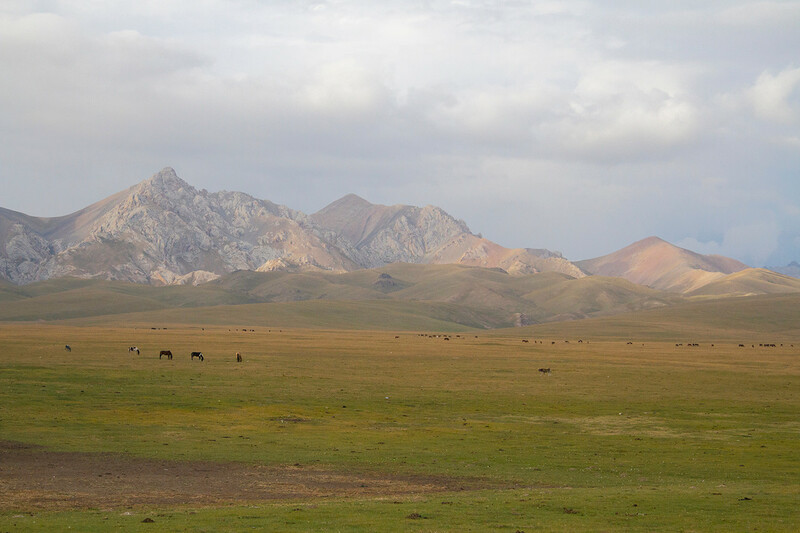 I’d opted to do a two day horse trek from Kochkor, in the north of Kyrgyzstan, to Song Kol Lake for a couple of reasons. The first was because I was far too out of shape to do a hike. Walking up the escalators of London Underground stations was enough to wear me out, these days. 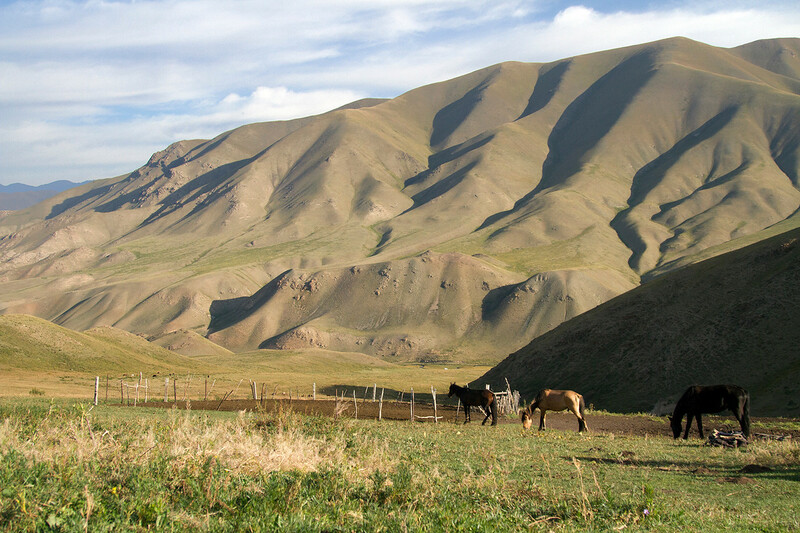 A horse trek seemed like a nice way to enjoy Kyrgyzstan’s scenery, without taxing physical effort on my part. The second was because I do really genuinely love horses, even though riding scares the bejeebers out of me. We should push ourselves to do the things that scare us, correct? Or is that an insane notion? I’m never quite sure. We were in for some heavy duty horse-related action, that was certain. We’d be riding for at least five hours a day, stopping for breaks every now and then. 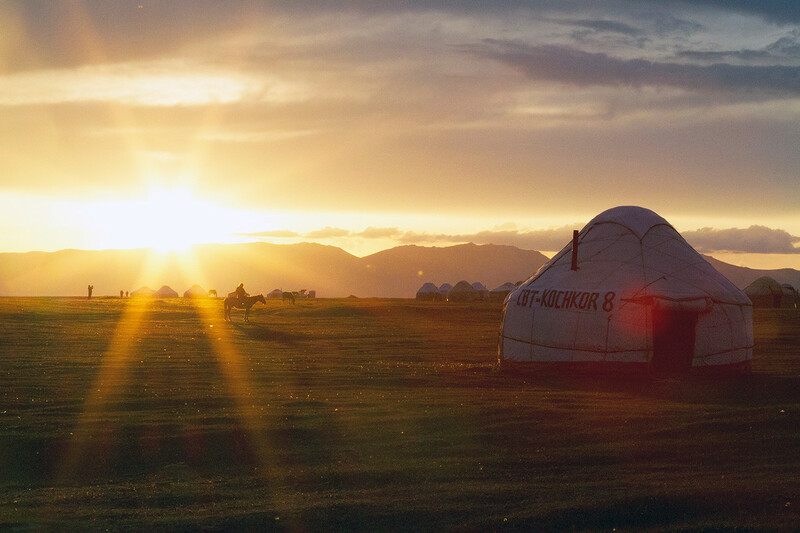 Our first night would be spent at a remote yurt camp, tucked in between the mountains. I’d wanted to name my beautiful buckskin horse and soon christened him Tortoise. He was slow (or just possibly lazy, he had a bit of an attitude to him, which I rather liked) but surefooted, picking his way carefully around the mountains. We’d ride up incredible heights and as the rules of physics go, would then have to make our way down again. I spent half the trip gazing around, marvelling at the sights and the other trying desperately to look straight ahead – not down, off the side of a very steep mountain. After several hours, we stopped at our first camp of the night. A secluded trio of yurts, sitting in the middle of nowhere. 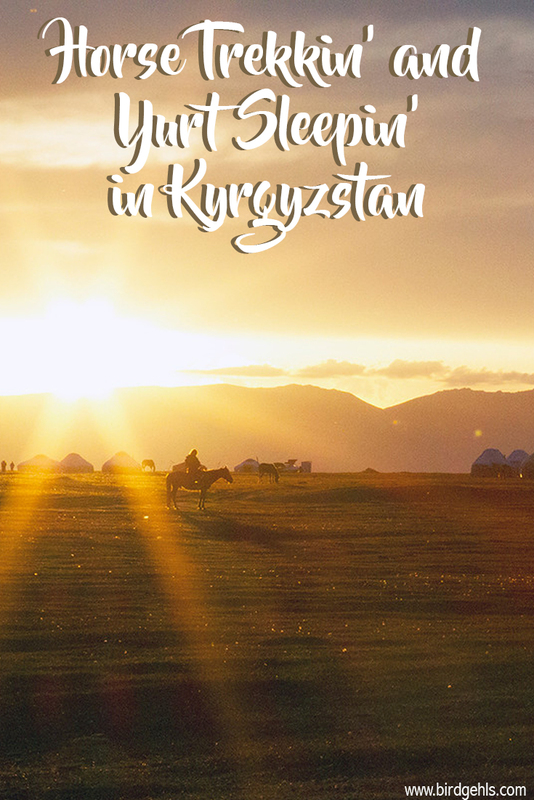 The Kyrgyz are still largely nomadic and spend the summer months camping in remote areas, fattening their animals up for the winter season. And it would seem, opening up their homes to whichever foreigners happened to pass by. 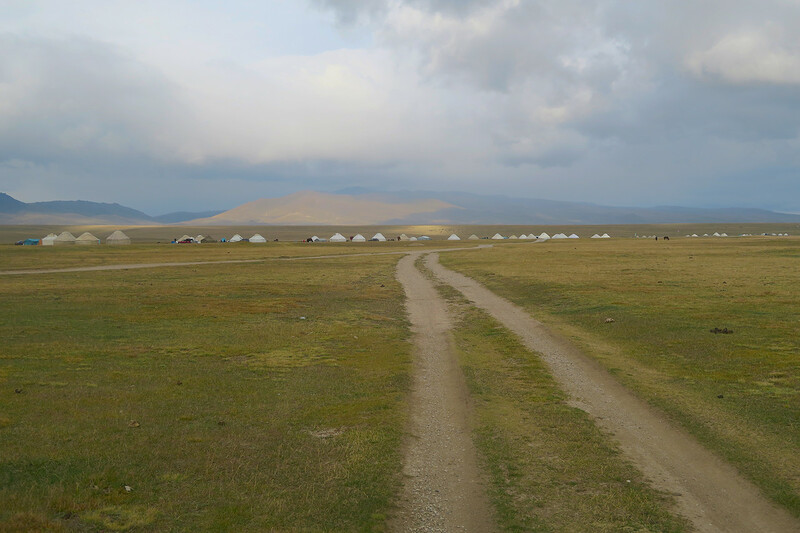 The first yurt camp we stayed at overnight. 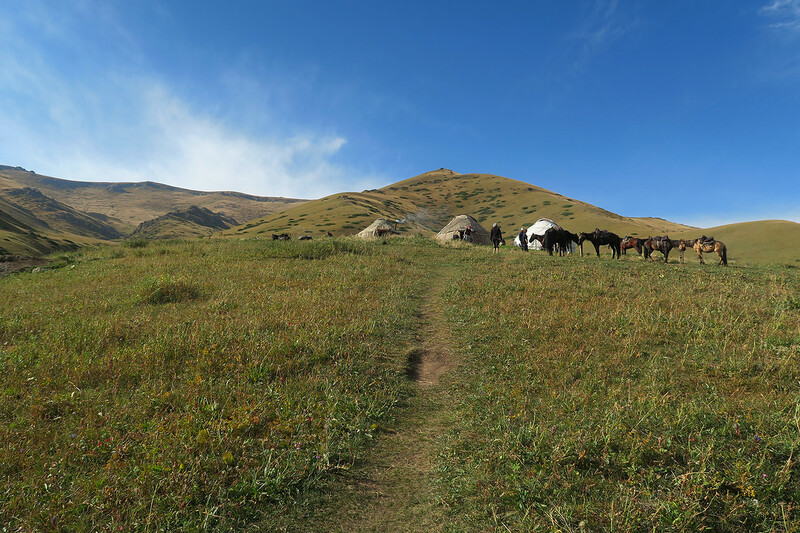 After the horses were tended to, we gathered in the “ladies’ yurt” (women and men sleep separately) for dinner. A full spread awaited us – stacks of bread and other pastried treats, heaps of cream, lollies and mug after mug of warm, comforting tea. Equally enjoyable were the cups of kymyz we were served. This fermented mare’s milk is, let’s say, an acquired taste. And acquire it I did, finding it to be particularly refreshing after a long day’s riding. 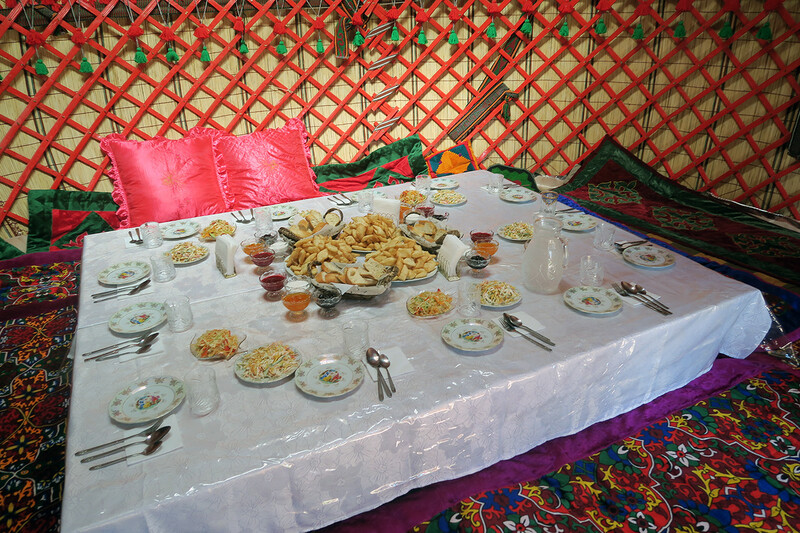 Some of the snacks that awaited us, inside the yurt. After dinner, the yurt was transformed from dining room to bedroom. Four mattresses were laid out, with blankets heaped on top of them. Despite the warmth of the early September day, the temperature plummeted once the sun disappeared. I was wary about how effective the yurts would be at retaining warmth, but was surprised to find my bed for the night to be quite cosy indeed. All I needed was a nightshirt and a pair of warm socks and I slept a very full and deep sleep. We were up early the next morning for a quick breakfast, before getting on our way. I tried to salvage as much of a morning routine as possible – brushing my teeth in the sink that had been set up outside our yurt and quickly washing my face. The most scenic dunny (toilet) I have ever had the pleasure of using. 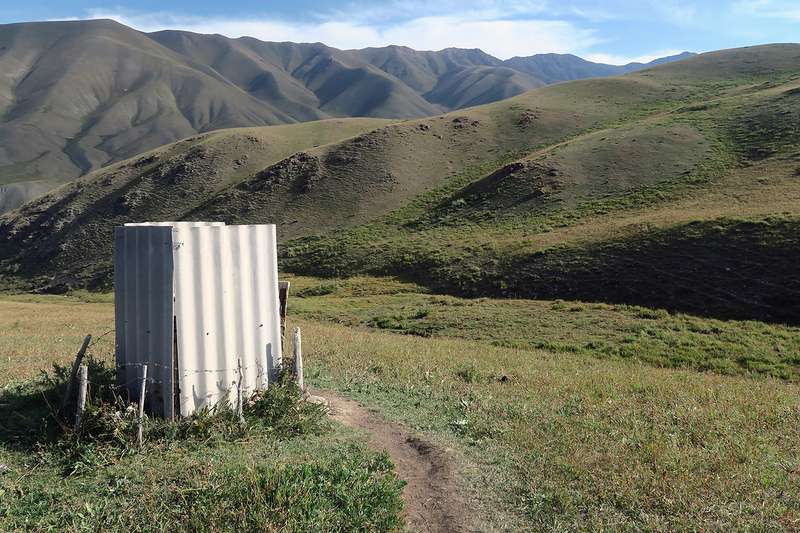 The toilet situation was interesting, but quite fun – three sheets of metal surrounding a hole in the ground. There was no door and no roof. I learned to sing loudly, just in case nature called for another camp member, whilst it was already in use. It was quite an experience to do your business in the dead of the night, while the light of millions of stars twinkled above your head. The horses unwind and recharge. Our belly’s full, we mounted our horses and rode off. We had quite some ground to cover before making it to Son Kol, which included the highest, scariest mountains as of yet. I grit my teeth and pushed on, willing myself to look down every so often to take in the views. What a sight they were. Now I can say I’m glad I did look down, as I would have been sad to miss out on this. 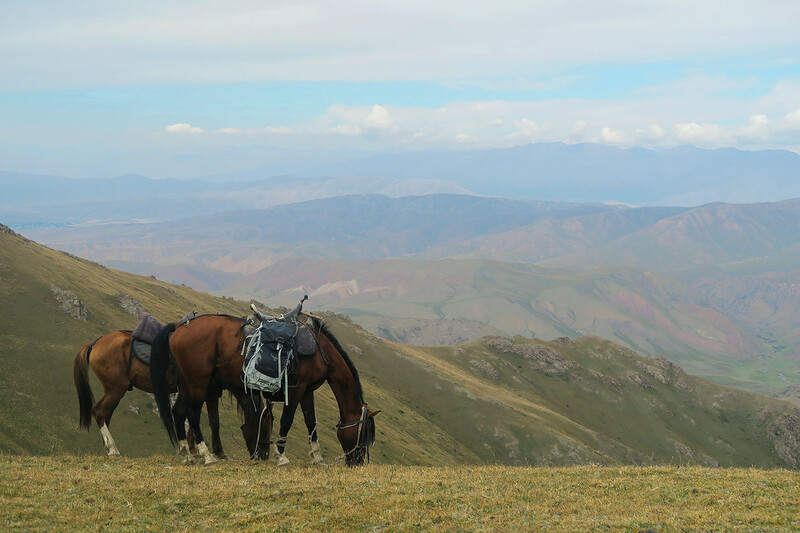 When we reached the top of the last mountain, we disembarked, rewarding the horses and ourselves with a break. This was the only point in the trip where we were able to get mobile phone reception – yet who cared? Sometimes it’s nice to simply switch off and enjoy the world around you. Stopping to take in the view. The horses didn’t care – they’d seen it all before. We rode on, stopping briefly at another yurt camp for lunch. As our horses rested, we made friends with a couple of the local dogs. Two of them seemingly enjoyed our company so much, they ran alongside us for the final two hours of the trip. As if I needed anymore convincing that dogs are the best animals ever. 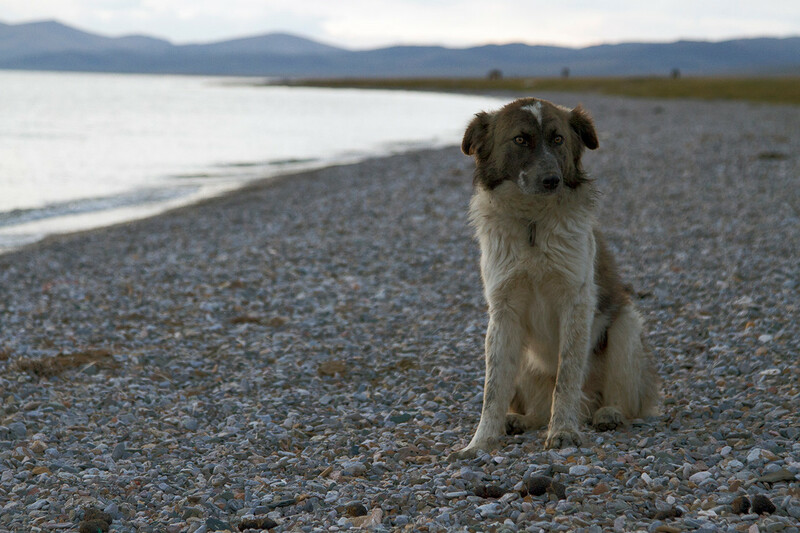 One of the dogs that followed us for two hours to Son Kol Lake. The ride to Son Kol was just a little bit pretty. We arrived at Son Kol in the late afternoon, as a thunderstorm closed in around us. Safe and dry, we began to explore our home for the night. 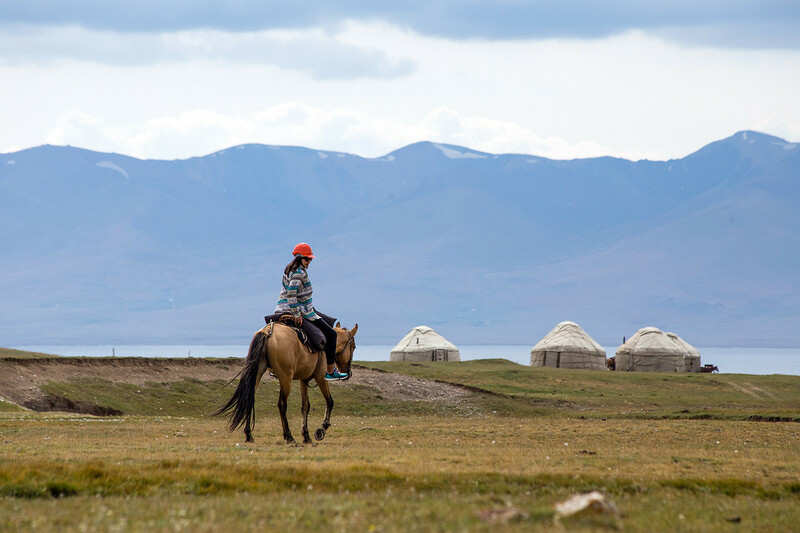 Unlike our last “yurtstay”, this area was home to a collection of yurts, all running adjacent to Son Kol Lake, an alpine lake which is the second largest in Kyrgyzstan. 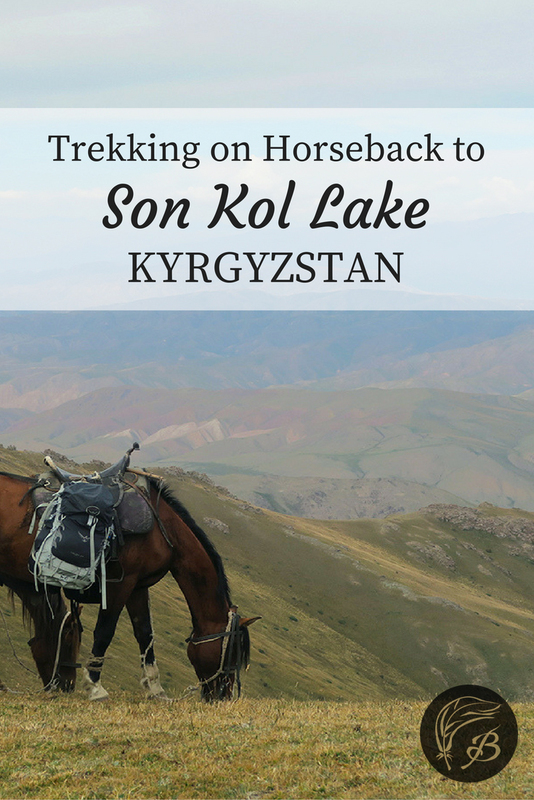 Son Kol is only accessible from June to September and we were here at the tail end of the season. The winter chill was already settling in, but the lake was as picturesque as ever. 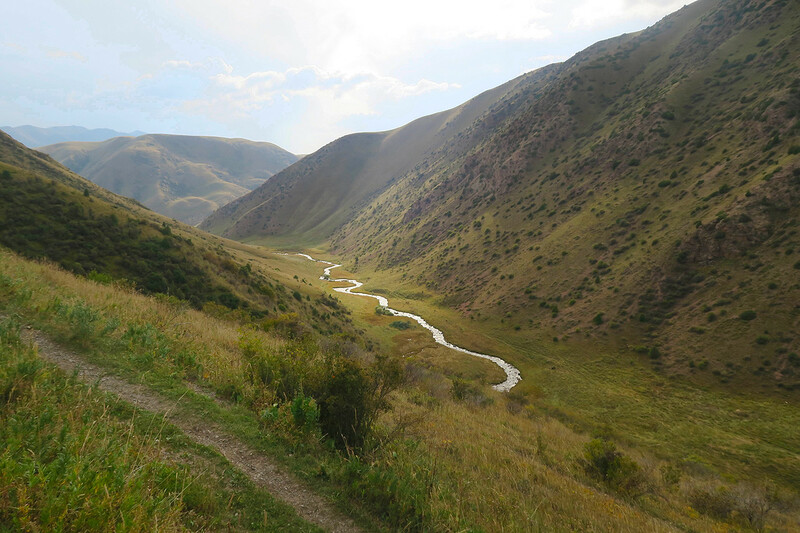 While it’s possible to travel to other regions of Kyrgyzstan at anytime even in the colder months of the year, September was perfect for riding to Son Kol. The days weren’t too hot, the nights not too cold. There’s a reason this month is my favourite to travel, a fact I was reminded of constantly during the two day trip. Son Kol sort of reminded me of a caravan park, but with yurts. The yurt that we were staying in that night seemed a little more permanent than the last, featuring a stove heater along with the piles of blankets and pillows. We went exploring for awhile – checking out the lake, taking photos and befriending the local animals. There were dogs everywhere here (including the cutest little puppy, that I really wanted to take home with me), as well as chickens, cows, horses, turkeys and even a trio of donkeys. They were fearless creatures, coming right up to us to say hello and hoping to receive a head scratch in return. We obliged, happily. Chilling with the world’s sweetest baby donkey. The night ended with yet another feast of plov (a sort of stew with veggies) and bread, accompanied by cognac and spirits. One shot of vodka was enough to lull me off to sleep that night. 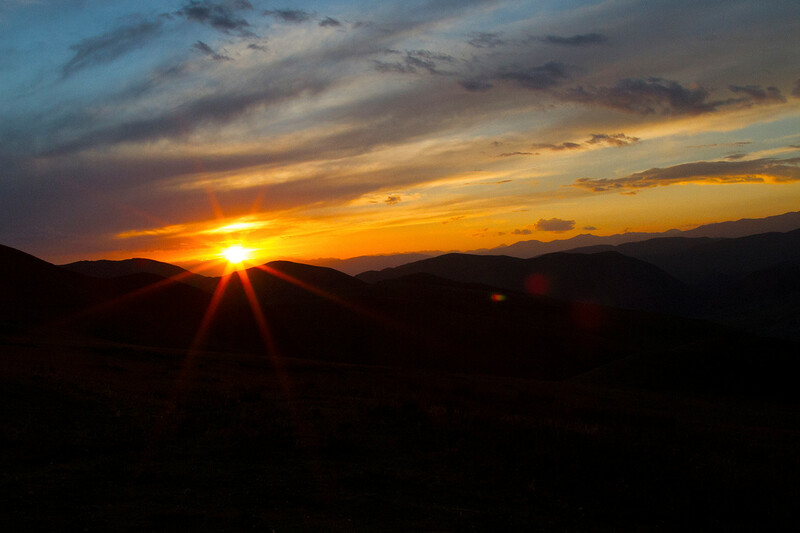 Expect to see the most dramatic sunsets just about anywhere in the Kyrgyz countryside. After another deep sleep, we were up again, for our last breakfast in a yurt. 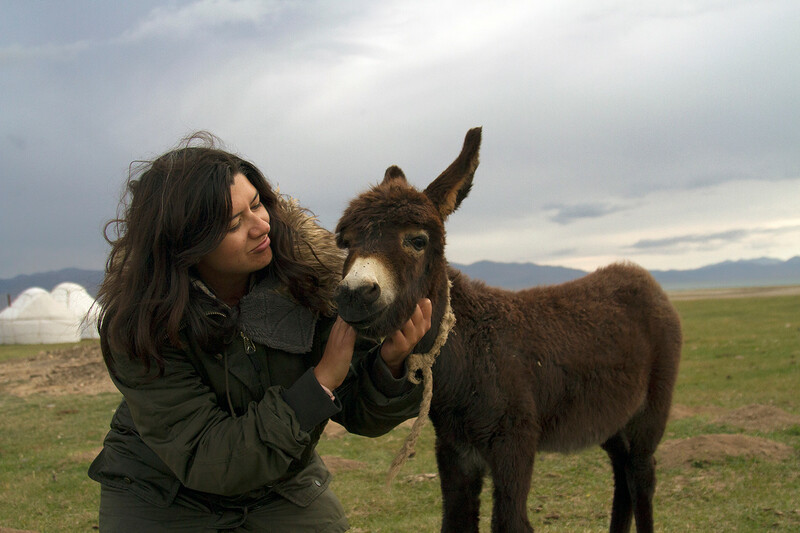 I said farewell to the various animal friends I’d made during my time at the lake and boarded the bus for the two hour drive to Cholpon-Ata – the setting for the 2016 World Nomad Games. Like the post? Watch the video! 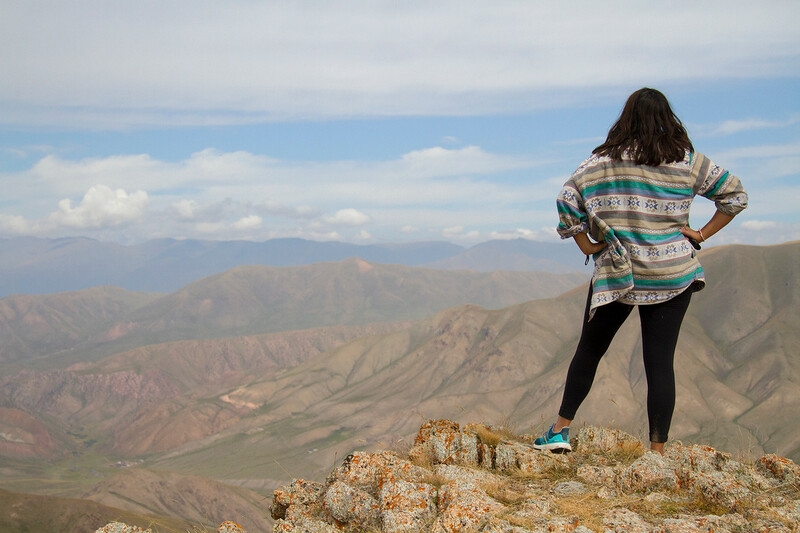 Our trip was organised in cooperation with Discover Kyrgyzstan and made possible by USAID. All opinions are my own. This sounds (and looks) like an amazing adventure! 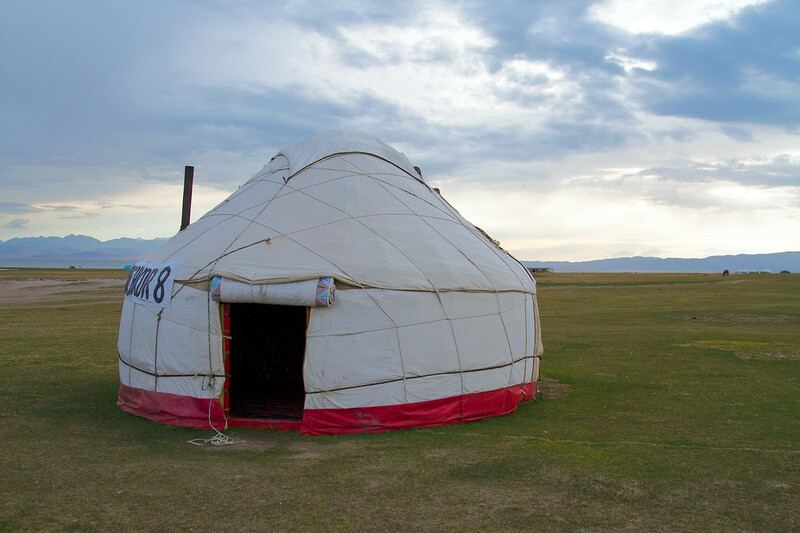 The views are gorgeous and the yurts look cozy. I’ve always wanted to spend the night in a yurt. They were super cosy! It’s an experience worth having for sure. I feel the same way about Mongolia! Wow~ What an adventure! Who knew that a 2 day ride on a horse could bring so many new experiences, such as the unique toilet. A great view of the universe awaited you, and I’m sure you won’t forget the experience. This looks like an amazing experience. I hope you get to as well, Kevin! It’s a country worth visiting! What lovely and breathtaking landscapes. It looks like an epic trip indeed. The photos are stunning and capture the magic of the place in vivid colour. I would love to do this but would have to hike instead of ride as my husband is horribly allergic to horses! Ha, the dunny wasn’t too bad, tbh! Sad about your husband’s allergies, poor thing. I couldn’t imagine being allergic to horses, I think I would have been a very upset 11 year old if that were the case. I’m sure a hike would be just as good. My heart just melted reading that the dog had followed you for last 2 hours of your ride!!! And what an amazing journey! I think you bond with animals well, and it is such a good thing. They were so cute, dogs are the best. Thanks Indrani, I hope so because I really, truly love them. This is such an awesome post! Fully want to do this now! You’re only going to hear encouragement from me! Wow! Wow ! Wow! Your photo gallery ‘s incredible. The landscape ‘s amazing, I am very like “Some of the snacks that awaited us, inside the yurt”. It’s attracted.